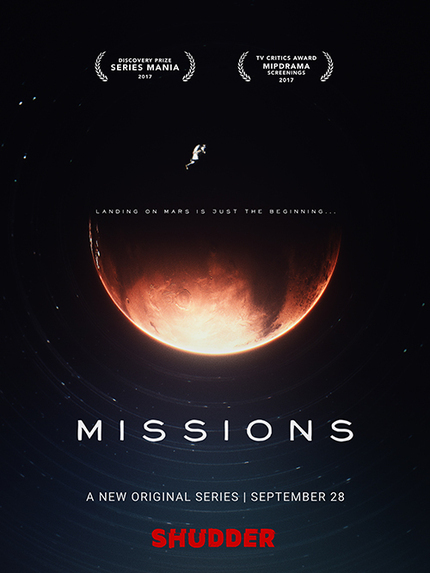 Shudder, AMC Networks’ premium thriller, suspense and horror streaming service, will launch the first season of Missions, France’s critically praised OCS Signature sci-fi series, on September 28, 2017 across its territories. Shudder will also co-produce the second season, slated to air in 2018. With the funding of an eccentric billionaire, the crew of a manned craft aims to be the first to land on Mars. Much to the dismay of all on board however, just before the culmination of their 10-month journey to the Red Planet, they are made aware of a video sent by a rival ship that has overtaken them and already landed on the planet thanks to a revolutionary engine. The bad news doesn’t end there however, as the tape contains a cryptic warning from the Americans pleading with the crew not to land as something far too dangerous is happening on the surface. After a chaotic landing on Mars, the crew finds a survivor -- but he’s not from their rival mission. His name is Vladimir Komarov. He is Russian. And he is the first man who died in space…in 1967. Screen Anarchy has been given an exclusive clip to share with you this morning. We have also included the trailer for the series as well. In the clip the presumed billionaire and the ship's psychologist discuss a psychological report she was to submit during their journey to Mars. She gives him the official and unofficial versions, setting up future character arcs to be sure.